Landmark Bicycles Expands to Avenue A: Yoga Studio in the Works? Suzanne Rozdeba Chung Pai, owner of Landmark Bicycles. Landmark Bicycles, which opened in the East Village almost five years ago on East Third Street, has expanded to a space around the corner on Avenue A. 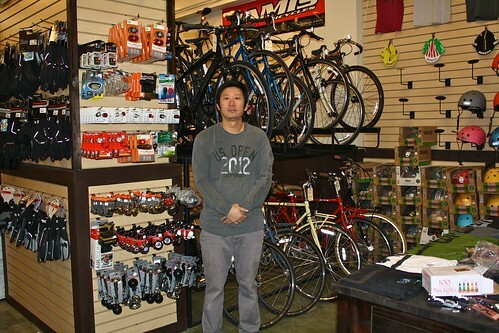 “We’re selling new bicycles and accessories in the new space, and will eventually move the store on Third Street downstairs, where we’ll continue to sell vintage bicycles and parts, and do repairs,” Chung Pai, 44, who owns the shops, told The Local this morning. The new store, where Mr. Pai pays $6,500 a month in rent, opened last Wednesday and was formerly occupied by Organic Modernism. He’s selling brand-name bikes including Jamis, Diamond, Biria and Viva, Chrome messenger bags and cycling shoes, and helmets, bike chains, locks, gloves, and lights. The new store is having a sale until New Year’s Day, with everything 10 percent off. Select messenger bags, used bikes and other items are 15 to 50 percent off. Daniel Maurer The flyer for the stolen cycle. 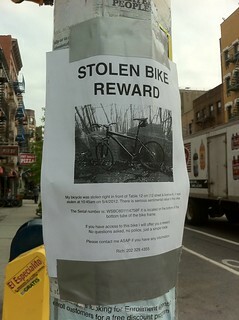 Remember the guy who recovered his stolen bike after posting flyers around the neighborhood? Rich Minkoff is hoping he’ll be so lucky. The Greenpoint resident’s custom-built bike, estimated to be worth $2,000, disappeared from Avenue A last week, and now he has papered the area in an effort to get it back. 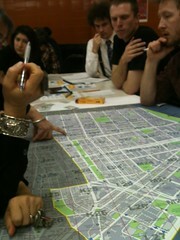 At a planning workshop on Monday night, the Department of Transportation asked residents of the East Village and Lower East Side to help it pare down a glut of suggestions about where it should place bicycles when it debuts its bike-share program this summer – but by the end of the session, its map had only grown denser with recommendations. At the workshop, sponsored in part by the program’s operator, Alta Bicycle Share – which has launched similar programs in Boston, Montreal, and Washington, D.C. – the department unveiled a map in which its own preferences for kiosk locations were marked in blue and the suggestions of local business owners were marked in purple. The department had divided the map into 1,000-square-foot quadrants. By May, it hopes to decide where each kiosk will be placed – about one per every quadrant, or roughly one every four blocks. Gersh Kuntzman The only other example of in-street parking in the city at Smith and Sackett Streets in Brooklyn. 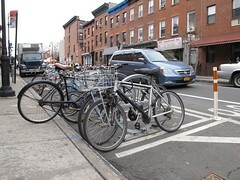 The Mudspot on East Ninth Street will get the first in-street bike parking of its kind in Manhattan, which will claim one space for a car and give cyclists eights new spots to lock up. 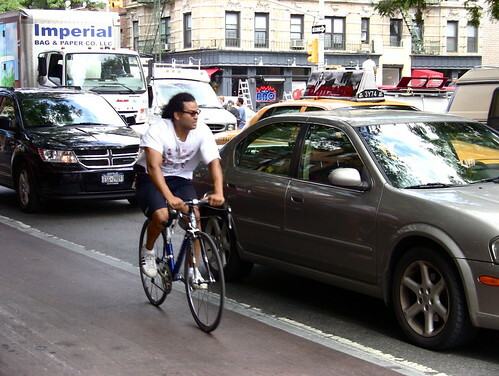 “As cycling increases in popularity, we’re starting to look to the street for parking,” said Hayes Lord, the bicycle program director for the Department of Transportation. Under the plan, a car-length space would be cordoned off with planters and four circular bike racks would be installed. Mudspot lobbied for the additional parking and will be responsible for keeping the area clean. 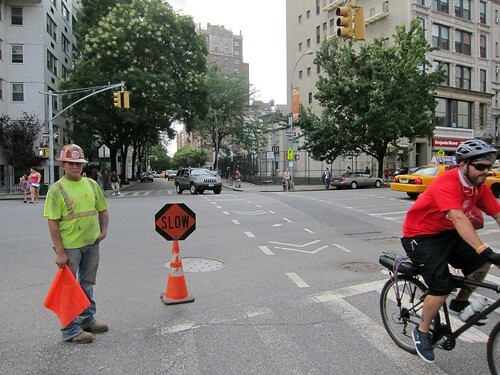 East Village cyclists have been put on notice. City workers plan to discard several abandoned bikes near East First Street between Avenue A and First Avenue, according to a Department of Transportation sign spotted by EV Grieve. Better pick yours up by the end of the day. The New York Daily News profiled former CBGB bartender Jane Danger, owner of Jane’s Sweet Buns. The shop, at 102 St. Marks Place, features baked goods with hints of alcohol, like a Rum Runner bun with nutmeg, cinnamon, raisins, brown sugar, Galliano liqueur and aged rum. Finally, Neither More Nor Less, Marty After Dark, EV Grieve, and Gothamist have photos from Saturday’s protest against East Village gentrification. Activist John Penley and his crew started at East Third Street, found its way to the BMW Guggenheim Lab and ended at what used to be Mars Bar. A poem was read. A cigarette was lit. Signs were waved, and then the protestors went home. Beautiful and ingenious as the bicycle may be, the human body is even more beautiful and ingenious, at least until the age of 60, and especially below the age of 30. And let’s not forget one important thing. As a pedestrian, I also fall into the category of partaking in A QUIET PROTEST AGAINST OIL, unless I’m in a cab. I just don’t have a sign, or a T-shirt, with which to make this fact plain. But I’m going to get one. It’s going to be a quiet protest against other, equally quiet protests.